Self storage is the answer! For a personal solution to your storage needs in the Forest of Dean. Self storage is do-it-yourself storage. 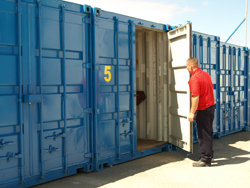 Once you’ve hired your storage space from a self storage company, you are free to use it more or less as you choose. This means you can transport your possessions to and from the storage space (called a “unit”) whenever you please, and keep them there as long as you need to. All good self storage facilities will be secure, easily accessible, clean and dry, and operated with user-friendly professionalism.